Learn about North Carolina's contributions to the war effort with soldiers both abroad and the homefront. The exhibit shares information on the various military installations in the state, discusses U Boat activity off the coast in 1918, and seeks to put the war in context. 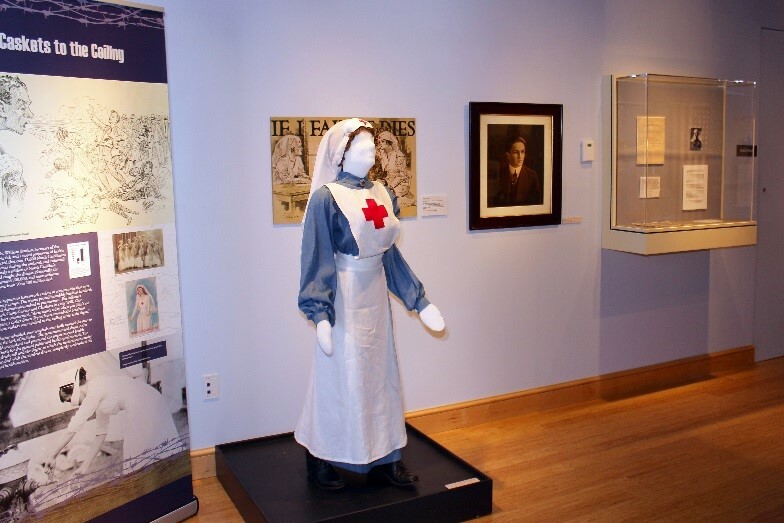 The panels can be placed in any order or configuration and accompany two mannequins--a soldier dressed in full uniform with weapon and complete backpack and gear, and a Red Cross nurse, dressed in a ward dress, apron, and cap with veil. The complementary exhibit handbook contains more information on the war in North Carolina and suggestions for educational activities.